At least that’s what us ‘professional’ fly-fishermen call it! Actually just kidding. I’m not a pro. Matter of fact, I probably don’t even qualify for ‘amateur’ fly-fisherman status. But I have been nymphin‘ on the Big Horn…..River, that is…..in south-central Montana, ’bout an hour and a half south of Billings. I was invited by my good friend, Ty Bean, from Hobbs New Mexico along with nine or ten other church leaders from Idaho, Washington, Texas, New Mexico….and me from Oklahoma. Some of these guys I know and a few of them I met when I got there. It’s an exceptional bunch of guys; strong leaders but ‘real’ people, humble, authentic and focused. 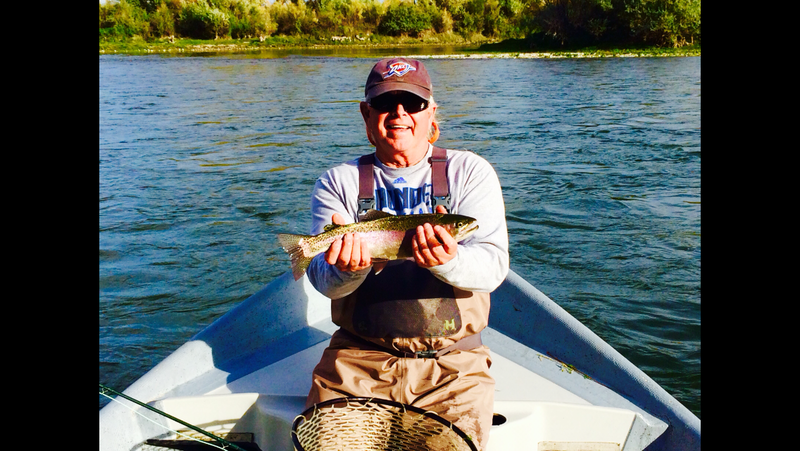 The Big Horn River is said to be one of the very best trout fishing spots in the world….and after fishing it for three long days, I believe it. We went out with professional guides. These men know their stuff and volunteer their time for these trips. Brian Carpenter, a true visionary, had a dream of bringing people like us in, giving them an opportunity to unwind, relax and recharge while doing some great fly-fishing and relationship building. He started The Refuge Foundation (click link FMI) a few years back and has a full schedule of guys coming in throughout the fishing season. It’s a top notch project. I’d never fly-fished before. I learned a lot of stuff! ….Like how to cast, mend and strip the line. Then there’s fishing with ‘dry flies’, ‘streamers’ and ‘nymphs’. It’s quite a learning curve for a flatlander like me but it was truly a great time. I’m already looking forward to fly-fishing again sometime in the future. Fly-fishing is kinda like a religion to these guys that do it all the time. I mean, there’s definite, clear cut, code of ethics about the whole thing. I learned some of that when I caught my first fish, a brown trout……about a 15 inch ‘er. All our fishing on the 13 mile trip down the Big Horn was ‘catch and release’. After taking a picture of me and my fish I just ‘chunked’ the trout back in the river. He made a good sized splash and on we went. Nobody said a word….but later Ty, in his extremely polite and gentle way explained to me that…..in trout fishing we don’t just ‘chunk’ the fish back out in the river. Nope….there’s a right way to do it. You just hold the fish underneath his belly and slowly lower him into the water being ever so gentle with him and then you just kinda wait until he slowly swims away. Hey, you live….you learn. But I’m guessing there’s a nice little brown trout out there somewhere on the Big Horn receiving counseling, and encouragement from some of his fish ‘brothers’ regarding his four foot belly flopper into the river. It was a great week and one I won’t soon forget. The friendships are strengthened and I got home re-charged. My guides, Dan, John and Larry were THE very best! Great guys, expert fish finders and best of all…..kingdom men! I’ve never had an experience quite like ‘nymphin’ on the Big Horn!